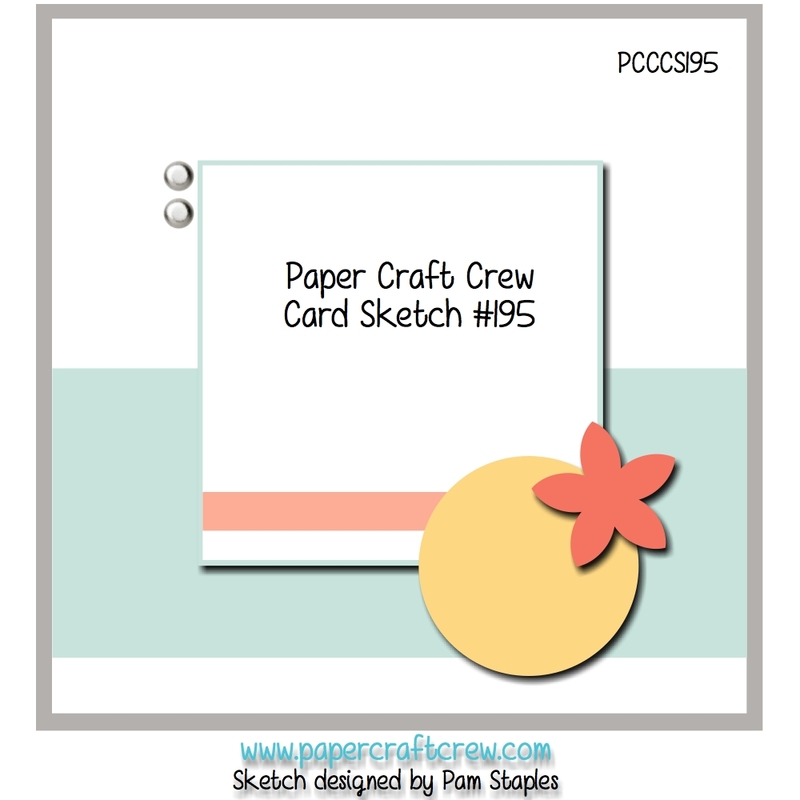 Welcome to another sketch challenge with the Paper Craft Crew! I just want to say ‘thank you’ for joining in our our challenges; I really enjoy visiting your blog and reading about how you created your project. I’m always blown away by the creativity that I see, and I appreciate you sharing! This week’s sketch challenge is one I hope you’ll find interesting – I think that Pam Staples, our leader, does a great job at coming up with interesting designs. I decided to add in a small element from a stamp set that is in the upcoming catalogue; can you spot it? I started with a card base of Crumb Cake cardstock, then added a panel of Very Vanilla cardstock on top of that. The next layer is a pattern from the Birthday Bouquet Designer Series Paper. To create my planter box, I used the Hearth & Home Framelits for the top of the box, and then just another scrap piece of Crumb Cake cardstock. 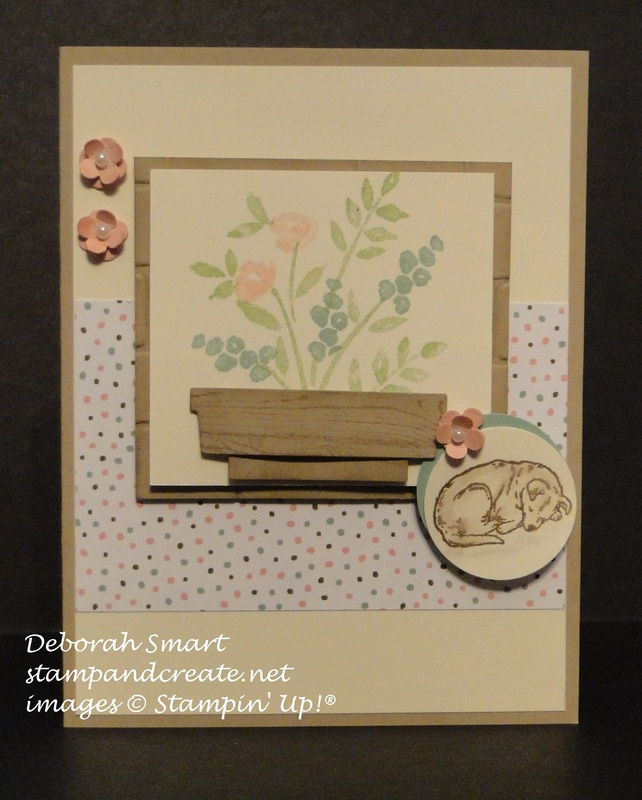 I then used my Woodgrain background stamp and Crumb Cake ink to make it look like it was made from wood. After attaching the 2 pieces with Dimensionals, I held it in place on the Very Vanilla cardstock, just long enough so I could place the image stamp from the Number of Years stamp set. The leaves were stamped in Pear Pizzazz ink, and the flowers added in Mint Macaron and Blushing Bride. Once that stamping was done, I then attached my planter using Stampin’ Dimensionals. I stamped the sleeping dog in Soft Suede ink onto a punched 1″ Circle of Very Vanilla, then used my Blender Pen and Crumb Cake ink pad to colour him in. I popped it on top of an offset 1″ Circle of Mint Macaron cardstock, and again used Dimensionals to attach it to my card front. The little flowers were punched from Blushing Bride cardstock using a retired ‘Itty Bitty’ punch; I layered 2 flowers together, then added a Pearl Embellishment in the middle of each one. I didn’t add a sentiment to this card front; this will allow me to either use it as is, and just focus on the inside sentiment, or I can add one later. I think this type of card can be used for any number of different occasions – and we all need lots of those! Thanks for spending some time with me today – I would love to read any comment you would care to leave for me. Previous Previous post: Time is Running Out!